What can I say about my posse? I chose my wedding party carefully. Everyone of those awesome women are special to me in some way. Heros wife . She married my older cousin and The Cousin's brother. She made me laugh the whole day of the wedding and the night before. She is sassy and sure of herself and she is an awesome mother to her three boys. She comes from a divorced family too so she can emphasize with me when my parents act goofy. Oatmeally. Good Lord that woman was dragged on every wedding errand since the Cousin lives in Jerzee. She was my rock and she has talked me down numerous cliffs since the 9th grade. BunnyButt. She tried on numerous dresses and had many ideas regarding bras and shoes (think pointed boobies and Missy Elliot boots!) She cheered me up when I was drowning with work, school and the wedding. K-Pooh. Stepped and resolved the great Hair and Make-up conflict of 2007! I called her crying that I was going to have to do my hair myself and good Lord I can't wear a pony tail to my wedding and whine and cheese and whine some more. The next day she had it all organized. Gotta love a woman who has a planner and cell phone and is not afraid to use it. your bridesmaids bouquets were gorgeous! 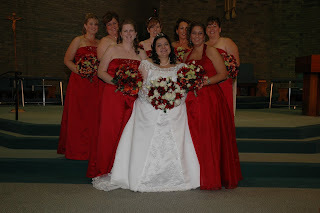 I love your wedding dress and the red b-maid dresses. I am hoping that my daughter's pick red (several years away).